Ah, Christmas! A time to eat, drink, be merry and fall into a turkey coma. Of course, in Australia, our summers render Christmas Day a little too hot to fully embrace the traditional heavy Christmas fare. 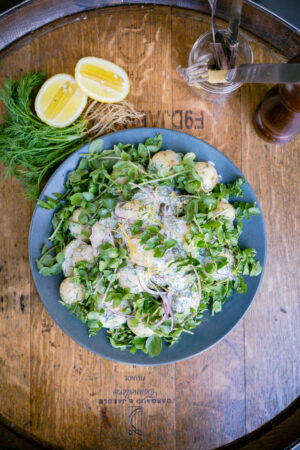 If you’re looking to mix up your Christmas repertoire with something a little lighter and more summery, Prahran Market brand ambassador, chef Tobie Puttock has put together some beautiful and simple recipes for an Aussie festive season. 1. Pop the potatoes in a pot; cover with cold water and add a good pinch of salt. 2. Bring to a boil and reduce to a gentle simmer for 15 minutes or until the potatoes can be pierced with a knife. Once cooked drain and set aside to cool a little. 3. In a large mixing bowl, bring together the creme fraiche, lemon juice, zest and extra virgin olive oil and stir to combine. Grate in some horseradish and stir. Have a taste, and add more horseradish as needed. 4. Add the potatoes to the bowl along with the onion, capers, tarragon or dill, and season with a pinch of salt and a generous pinch of cracked pepper. Carefully fold through the pea cress and serve. 2. Flip a dinner plate upside down onto baking paper and use a pencil to trace around the perimeter of the plate. 3. Pop the egg whites into the bowl of an electric stand mixer and beat with a whisk attachment until stiff peaks have formed (this can also be done by hand). 4. Add the caster sugar a little at a time, mixing in between each addition of sugar. Once all the sugar has been added, add the vinegar, cornflour and vanilla and mix to combine. 5. Flip the baking paper used to trace the plate upside down onto a large baking tray and spoon the meringue inside the circle, creating a dip or crater in the middle of the meringue (this will be for the cream and berries once ready). 6. Put the tray into the preheated oven for one hour. Turn the oven off and allow the meringue to cool completely in the oven before proceeding (this step can be done the day before if preferred). 7. Halve the strawberries and pop a good handful into the bowl of a food processor with the two tablespoons of icing sugar. Blitz to a puree and then pass through a strainer, discarding any seeds. 8. Add the remaining strawberries and any other berries into the bowl with the strained berry mixture and carefully fold together. 9. Whip the cream with the remaining icing sugar until you have stiff peaks. 10. To assemble, spoon the whipped cream into the crater of the now cooled Pavlova. Spoon the berries on top of the cream and pour any remaining juices over the top to decorate.